The Maillard reaction is the scientific name for the process, named after the French discoverer. It refers to the reaction that happens when food is heated to temperatures above 250F/121C. Consequently browning can never happen in water, which can only be heated to 212F/100C before evaporation begins. At high temperatures protein and sugars (or other carbohydrates) in the food react in complex ways changing color (browning) and intensifying flavor while drying the outside of the food thus producing tasty crisp exterior or great crust. If only sugars are present caramelization occurs, when proteins are present also, the maillard reation takes place. You already know the reaction well from your everyday life. Think for example of the color and flavor of the crust of a good bread, the complexity of flavors in roasted cocoa and coffee beans. Roasted nuts are darker and have much more flavor than raw. The same thing is true when cooking meat. The color and the flavor changes for the better. Can you smell a steak on the barbeque? That’s the Maillard reaction at work. I digress a bit, but I want to throw in an important note on how to cook great meat. Two notes actually. You want the exterior slightly crisp and full of flavor while keeping the inside juicy and moist, right? Do not overcook. Secondly, the key to good meat is to let it rest a couple of minutes after cooking. It’s chemical, but the important thing to keep in mind is that while the meat finishes cooking off the heat, the meat relaxes and in return retains more juices thus becoming more tender. Well worth your wait. The browning effect also applies to vegetables when roasting, grilling or broilling. The flavor is highly intensified with a slightly caramelized undertone when cooked these ways. There is nothing wrong with boiling or steaming your veggies. These cooking methods emphasize the natural flavors of the vegetables and that too is delicious. It depends what you like and want. With simple kitchen science, you have more power to achieve the taste you are looking for. I am reading a book called Ideas in Food . It is very informative and I am learning new things and being reminded of things I had forgotten. The authors generously share tricks. Here is one on controlling the Maillard reaction. Adding small amounts of baking soda, they claim, will speed up the browning reaction. Contrary when adding a splash of vinegar, it supposedly slows down the process. Interesting, right?! If you try it out, then let me know if it works and I will do the same. Enough kitchen science for now. Why did I share this with you again? Well, to give you more control in your kitchen. Your food will taste better and guess what happens when a meal is very satisfying and flavorful? You tend to eat less! It’s true. It’s a win-win situation for both taste buds and body. I have illustrated the browning effect with a granola bar turned into granola. I was experimenting with a new recipe – granola bar with cherries and pistacchio nuts. I had to bake the bars at high heat for quite a while to bring out the caramelized complex rich flavor of the oats and get a good crunch. I achieved the taste and crunch I wanted, but the bars didn’t stick together as I had hoped. 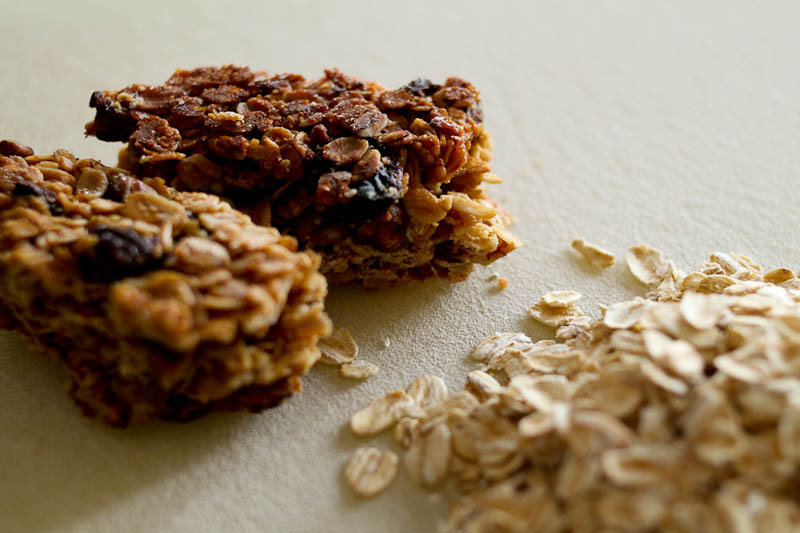 So crumbly bars turned into amazing granola. The point is that the extended heating of the sweetened oats created the most intense delicious flavor. So although the bars failed, thanks to the Maillard reaction, the granola is a winner. Mix all the wet ingredients and pour over the dry ingredients. Except dried fruits. Bake on sheet pan for app 30-40 min. Stir once in a while to ensure even baking. Mix in dried fruits when done. Store in airtight container for weeks. Must be completely cooled off before storing. Note: If you are going for the crumbly bars, then mix the dried fruits with the rest of the remaining ingredients and bake. Sources: On Food and Cooking by Harold McGee, Ideas in Food by Aki Kamozawa and H. Alexander Talbot. This entry was posted in Breakfast, Sweets and tagged browning effect, granola, healthy food blog, maillard reaction, recipe. Bookmark the permalink. Almond butter, is it almost the same as peanut butter? You can use any nut butter you like. It is just a matter of taste. If you have extra time on the weekends, you can make your own nut butter by simply blending the nuts in a food processor. You will know by how it looks when it is done. PS If you toast the nuts first, the nut butter will be more flavorful. I really appreciate your feedback and I have consequently made a few corrections to the post.